MHCAN has faced a crisis for the last several years with police and city agencies breathing down its neck. The management of MHCAN and its Board of Directors has chosen to pursue, largely a low-profile work-behind-the-scenes approach. There’s been little publicity about the upcoming Special Use Permit meeting of the Planning Commission which Board Chair Steve Pleich says is slated for 9-28. A month ago, I wrote the following suggestions to the community. +++ End police collusion and surveillance with right-wing community organizations and unreasonably anxious neighbors and businesses trying to cook up “evidence” of a crime wave or public nuisance. The surveillance and heavy police presence has been frightening to clients and is an abuse of the police department’s funding and mission. We want assurances that this abusive behavior, supposedly either lessened or discontinued, will be definitely stopped and not resumed. +++ Drop all proposed restrictive demands on MHCAN and hold public hearings on any new attempts to impose such conditions as restrictive hours, limiting daily client numbers, security guards, meeting bans, and other destructive restrictions that interfere with or work in direct opposition to its traditionally effective mission. This approach has created a hostile prison-like atmosphere at the Homeless (Lack of) Services Center and treats unhoused and disabled people like convicts. +++ Restore autonomy to MHCAN, originally an effective client-run organization with an impressive track record for helping those in psychological distress, whatever their housing or financial status. MHCAN can and should determine its own policies and limits within normal city guidelines. +++ Create a legal and firm policy of nondiscrimination against low-income people as well as establishing a protected class punishing violence against the unhoused as a hate crime here. +++ Acknowledge the sidewalks, city benches, and other areas around MHCAN are public areas and restore the right of all community members to use them without fear of harassment–not subject to restriction or control by private interests, whatever their fears. Cite and prosecute real crimes. The campaign to remove visibly poor from the public domain is both unworthy and unconstitutional. +++ Disentangle city and county funding from restrictive covenants and restore traditional practices at MHCAN generally or require public hearings to justify attempts to shrink its services. +++ Establish in local law and policy of respecingt the rights of the disabled—whether the disability be physical or mental to include such obvious needs as the right to sleep, to use public spaces, to be secure in their persons and property, to be free from harassment by authorities and private vigilantes. This letter reflects the views of Robert Norse and some HUFF members—and hopefully a large chunk of the informed community. Tuesday Aug 22nd, 2017 updated August 24 4:20 p.m. There was no prior public hearings nor any media announcement of the new law which bushwacked the community on Tuesday, only appearing on the agenda a week ago. On 8-22 City Council voted on the First Reading of a harsh law expanding Councilmember Terrazas’ 4-Year old Anti-Homeless law today at its 2:30 PM Session. The law targets homeless community members for sleeping, being in a “park” after dark, obstructing the sidewalk, etc. It vastly expands the unconstitutional sweep of the current 13.08.100. The proposed law will include not just anyone within 300′ of a school, but anyone in any of the following parks as well as any adjacent sidewalks and public spaces: Arana Gulch, Neary Lagoon, Depot Park, Poets Park, Beach Flats Park, Harvey West Park, Pogonip (Open Space), Louden Nelson Park, Sergeant Derby Park, Mission Plaza Park, Star of the Sea Park, Moore Creek (Open Space), University Terrace Park . Nice way to make the parks “homeless free” if you start giving longer Stay-Away orders (as has been regularly done for the last three years) to folks who sleep there at night. And, of course, we know how massive a school children presence there is at night when homeless people are sleeping—particularly far away in the deep Pogonip, or down in the San Lorenzo benchlands. It’s certainly a necessary precaution to sanitize the area by banning folks found sleeping there or just being there “after hours”. We must have certain Rules of Conduct after all! If you’re given a citation — even it’s unjustified, and dropped short of court — you are banned from the area (and other prior areas if you’ve received citations) for 72 hours. If you return you face up to a year in jail and $1000 fine. Since 2013, the use of “we don’t need to charge you in court” Stay-Away orders, have systematically and specifically impacted, if not targeted, homeless folks. The “crime wave” being addressed is the usual: sleeping, being in a park after dark, smoking. Hundreds of citations and stay away orders were issued to folks. It also provides massive police powers to criminalize protesters and outspoken Council critics, particularly homeless ones. The earlier 24-hour/1week Stay Away order was one device used to drive away Freedom Sleepers and the Survival Sleepers from City Hall. Second reading will be required at the next Council meeting which may give folks a little organizing time to speak against it in two weeks when it reappears for a rubberstamping. This wording is horrendous in and of itself. It means if you are, say, given three infraction citations in three different places over the course of three days (or even three weeks, if the second ticket happens within a week of the first), the Stay-Away law empowers police to ban you for three months from all three areas. All before you’ve gone to court to get a “fair trial”. And if you get a 4th ticket anytime within the next 18 months in any park or other area covered by MC 13.08.100, you can be banned for 1 1/2 years from all 4 areas. If at any time, you violate this police-imposed ban any time during these periods, you face a possible year in jail or $1000 fine. The standard fines are $200-400 for the original infraction crime. The phony process for “appealing” a Stay-Away order involves going before an appointee of City Manager Martin Bernal, whose employees are the cops and rangers testifying against you if you file an “appeal” within 1 day. There are no “rules of evidence”, no official record of the proceeding, no provision permitting an audio recording, no right for the public or media to be present–in other words, no due process. Doo-doo process indeed. The standard of proof is different before the City Manager’s kangaroo court–it’s “preponderance of the evidence” (51%) unlike the “beyond a reasonable doubt” standard of the courts. Hence you can be improperly banned for weeks from public property (particularly important for homeless people trying to survive by hiding out) before you get your court trial. And then even if found innocent, there’s no provision for reversing the Stay-Away. To read the specifics of the “in-house” appeal of Stay-Away orders process, go to MC 13.08.100(b) at http://www.codepublishing.com/CA/SantaCruz/ . We’ve heard a token squeak or two from our timid local ACLU– whose regional and national affiliates have quadrupled their cash reserves since the Trump victory protest. As for actually sending volunteers to help folks expose this travesty? We’re still waiting. Courts, of course, provide little real protection from infractions, even if you trek to and from the courthouse waiting for the citation to appear, getting to the arraignment, going to the trial. The overwhelming majority of unhoused folks getting the infraction citations that accompany the Stay-Away orders have neither time, energy, nor resources to do this. In an infraction case, you get a “judge” rather than a jury trial. You face toxically police-partial judges–even if you disqualify the Dept. 10 Commissioner and send the case to a “real” judge. And even with video documentation of false claims, selective enforcement, and/or harassment by police or rangers, the “real” judges convicted activists Abbi Samuels and Keith McHenry in two separate trials recently. This had the appearance of being part of the City Manager/SCPD campaign to drive away peaceful Freedom Sleeper protesters and Survival Sleeper homeless from City Hall. Even from the half of the sidewalks adjacent where they slept every Tuesday night in protest. Infraction cases normally go to the Commissioner in Dept. 10, previously the notorious Brimstone Baskett who went to great lengths to provide the semblance of fairness and then finds you guilty. Baskett has now been dumped on us as a “real” judge in Dept. 4. I have no new info on the new Commissioner in Dept. 10 who hears cases. This latest giveaway to the “homeless get out” crowd at Take Back Santa Cruz, Santa Cruz Neighbors, the SCPD, and conservative staffers comes out of the bowels of Vice-Mayor Terrazas’s “Public Safety” Committee. As far as I know, it’s done zero outreach among folks outside to determine the impact of the current Stay-Away law–which has harassed and excluded hundreds of poor people without shelter. The map showing the dramatically expanded “Stay Away Even Before You Get Charged in Court” zones is at http://scsire.cityofsantacruz.com/sirepub/cache/2/d5tnqexznorzejga3wurjtew/463211108232017052436570.PDF. Terrazas’s sedulous scare narrative whitewashes the actual bigotry agenda of this law. The protective clothing for this bigoted expansion of police power and invitation to vigilante action is “child welfare”–all without any statistical evidence. The boogyman label is “school safety enhancement” . If you examine the map, though, it’s mostly areas beyond the 300′ “safety zone” that suddenly kicks in triple stay-away times. (Again without a court appearance or finding of guilty). The “evidence” used to back this police power expansion were anecdotal stories from two Take Back Santa Cruz activists who regularly sit in the City Council who’d heard a story about a child being threatened in a park and another eye-witness account of a fight in a park. The only police stats presented in the agenda packet were the “alarming” but actually quite predictable significant percentage of police “calls for service” and “citations” in the parks. There was no breakdown, of course, as to what those citations were for, whether there were convictions, nor how many were accompanied with stay away orders. The police statistics actually presented were used to dramatize a misleading narrative of “bad behavior”, “failure to maintain behavior standards”, “environmental degradation” and, of course, “public safety for our children” in the park areas. However HUFF’s detailed study of Parks and Recreation citations for 2013 documents these were status crimes involving non-aggressive survival behavior by homeless people like smoking, sleeping, and being in a park after dark (See “Stay-Away From Human Rights ! An Activist Examines the Escalating Stay-Away Orders Law” at https://www.indybay.org/newsitems/2014/10/25/18763326.php). More stats on an earlier version of this law are at https://www.indybay.org/newsitems/2014/10/12/18762778.php (“Nasty Anti-Homeless Stay-Away Laws to Get Exponentially Worse”). To read some of the bigoted babble that goes on around this issue plus Sentinel coverage, go to http://www.santacruzsentinel.com/government-and-politics/20170822/santa-cruz-eyes-new-school-safety-zone-park-law . Why bother with real evidence and argument when you have a locked-in 5-2 majority on the City Council (it actually passed 4-1 with Brown and Chase absent). It’s hard to believe that rational, reasonable, mellow-sounding people like Vice-Mayor Terrazas seems to be…that they can pass this kind of straightforward repression. Terrazas has been rubberstamping like measure for years, though, through his Public Safety Committee. Perhaps it’s raw meat thrown to the right-wing constituency, angered at the appearance of increasing numbers of visible homeless people (ironically becoming visible through being driven out of the parks and downtown). The appearance of action without the substance. More laws for useless and unconstitutional police actions. More on the City Council capers last Tuesday when I muster up the energy. Free Radio Santa Cruz is currently off the air due to equipment problems, but I hope to go into the broader Council meeting in more detail next Sunday. Pacific Ave. without being driven away by Santa Cruz’s noxious ‘Move ‘Em Along” law on Friday November 7- 2 PM at the City Attorney’s Office 333 Church. 4 PM 11-8 Saturday KSCO (AM 1080) Restoration of Human Rights for the Homeless advocates versus StabSantaCruz anti-homeless blogger Helbard Alkhassadeh. 5 PM 11-10 on the sidewalk near Calvalry Episcopal at Church and Cedar. out-of-town attorney Paul Cook will advise homeless people losing property and rights how to reclaim them or their cash equivalent in Small Claims Court. 3 PM Cafe HUFF and Joe Schultz will provide food for the 11-11 Tuesday City Council meeting fighting colored dot “performer pens” on Pacific Avenue and “Stay-Away” laws. 5 PM on the same day disabled activist Pat Colby will seek a long-refused written disability dispensation at City Council so that she can show her crafts on Pacific Ave. without being driven away by Santa Cruz’s noxious ‘Move ‘Em Along” law. Santa Cruz is experiencing a crackdown on homeless people, travelers, street artists, and just those seeking to use public spaces without police harassment. Paranoia around the Drug War is being used to futile a thinly-concealed “Scare ‘Em Out of Town” agenda against homeless people–long a target of city laws, police, and rangers. Restoration of rights and restitution for damages is likely to come only when tenants, students, minorities, the elderly, working folks, and homeless join in a broad coalition to refocus on the white collar crimes of the 1% and the complicity of the 30%. Steve Pleich, attorney Judy Bari, and MHCAN activist Sarah Leonard are working on filing a class action lawsuit that may stop the regular conflscation and/or destruction of homeless survival gear and personal items. In a grim and little-noticed follow-up to NIMBY attacks on homeless recyclers, first one and then the only remaining recycling center in city limits has reportedly closed down without public hearing or notice. I am told the nearest one is now in Capitola. We are seeing food programs driven or pressured indoors to avoid the community seeing visible poverty, prison-like conditions developing at the Homeless Services Center, harsh library regulations to step up the pressure on homeless people there, churches cutting back their programs, and massive over-policing downtown, in the parks, and at the Beach. Against this ugly darkening picture, activists are working to document the financial and human cost of new Jim Crow laws against the poor, to speak out against them, and to mobilize legal resources to fight back. 4 PM SATURDAY 11-8 ON KSCO Folks can listen in to KSCO at AM 1080 or do so on line. The call-in number is 479-1080. We will be seeking support for strategies legal and streetside to restore basic civil rights to homeless people suffering from the massive increase in ticketing and harassment. 5 PM MONDAY 11-10 on the sidewalk outside THE RED CHURCH (Calvary Episcopal Cedar and Lincoln) Attorney Paul Cook has successfully beat back attempts to shut him down in Baldwin Park in southern California (http://alchemistcook.blogspot.com/, interview at http://radiolibre.org/brb/brb130919.mp3 –29 minutes into the audio file). He will advise people how to file claims against the city and small claims court papers to recover stolen property and rights and expose official abuses. 3 PM TUESDAY 11-11 outside CITY COUNCIL CHAMBERS Protest demanding an end to Stay-Away Orders, Performance Pens, Forbidden Zones, and other repressive restrictions on public space in Santa Cruz–particularly those impacting the poor and homeless. Cafe HUFF will serve coffee and brownies. Jumbogumbo Joe Schultz will provide savory hot vegan soup. 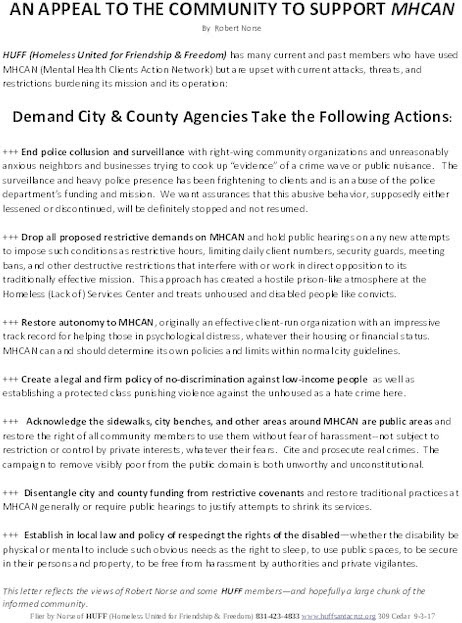 5 PM TUESDAY 11-11 at CITY COUNCIL (809 Center St.) Disabled activists will confront City Council and the City Attorney to demand written authorization so they can vend, perform, sit, and sparechange downtown without suffering hundreds of dollars in fines under tghe “Move every hour for 100” and begone for 24 hours” law [MC 5.43.020(2)]. NORSE’S NOTES: Following in the pawprints of its elder bigoted brother Santa Cruz to the North, Monterey has reversed itself from a similar proposal a year ago and passed a Sitting Ban that is somewhat less stringent. In 2013, a big turnout of homeless activists, housed supporters, and social service providers sent a similar Ban back to the staff, from which it has emerged zombie-like to stalk the homeless community. The Monterey law, unlike the Santa Cruz law applies only from 7 AM to 9 PM, mirroring a similar law proposed (but defeated) in Berkeley. Santa Cruz’s Sitting Ban is 24-hours long (MC 9.50.012). Like the Monterey law, Santa Cruz’s was passed with no stats proving any kind of meaningful business concerns other than the anxieties of post-earthquake Santa Cruz and the special interests of merchants, then lead by Bookshop Santa Cruz owner Neal Coonerty. The sitting ban and the smoking ban are the primarily weapon used by Officer Barnett against homeless people downtown (See “Report from SCPD Corner” and the Barnett ticket citation record at https://www.indybay.org/uploads/2014/09/18/barnett_cites.pdf ). To view the video and comments go to http://www.kionrightnow.com/news/local-news/sit-and-lie-ordinance-goes-into-effect-wednesday-in-monterey/28333580 . On Monday in Monterey, sitting on the sidewalk was still OK but by Wednesday, you could be facing a citation from police for doing the same. “They are interfering with my business,” said Joseph Aiello of people who he says are often sitting around outside his jewelry store. The idea of a sit-lie ordinance has been a long time coming for Aiello and his business. He says that people loitering outside his shop deters potential customers. “When they see panhandlers out on the street, they feel uncomfortable and therefore, they walk by real fast to get to where they are going,” said Aiello. Starting Wednesday, between 7 a.m. and 9 p.m., officers have the authority to tell people to get up from the sidewalk in downtown, Cannery Row and along Fremont Street. “For the next 30 days, that warning stays in effect and if you are found doing it again you get a citation,” Monterey police said. Officers insist they won’t just be targeting homeless individuals. Penko say he hopes his department doesn’t have to write a single ticket even though Aiello says his business, a staple on Alvarado Street for the last 30 years, is in trouble and the loitering isn’t helping. There are exceptions to this rule -you may sit on the sidewalk if you have a medical emergency, are attending a parade or festival, or you’re in a wheel chair or baby stroller. In response to increased complaints regarding safety concerns created by obstructed sidewalks, the Monterey City Council adopted Monterey City Code §32-6.2. This ordinance, which goes into effect October 1, 2014, prohibits sitting or lying down on the sidewalk in front of property designated on the General Plan map for mixed use areas (see map) between 7:00 a.m. and 9:00 pm. The ordinance contains exceptions for people: (1) experiencing a medical emergency, (2) using a wheelchair or other device for mobility; (3) for people sitting on a public bench or bus stop; (4) operating or patronizing a commercial establishment conducted on the public sidewalk pursuant to an encroachment permit (e.g., a sidewalk café); (5) participating in or attending a parade, etc. with an event permit or other applicable permit; and (6) a child seated in a stroller. It also requires that no person will be cited without first being given a warning by a peace officer that he/she is violating this section. One warning given by a peace officer is sufficient for a 30 day period for subsequent violations. Police officers have been actively working to inform people in the designated business districts. On Monday in Monterey, sitting on the sidewalk was still OK but by Wednesday, you could befacing a citation from police for doing the same. The idea of a sit-lie ordinance has been a longtime coming for Aiello and his business. He says that people loitering outside his shop deters potential customers. In response to increased complaints regarding safety concerns created by obstructed sidewalks, the Monterey City Council adopted Monterey City Code §32-6.2. This ordinance, which goes into effect October 1, 2014, prohibits sitting or lying down on the sidewalk in front of property designated on the General Plan map for mixed use areas (between 7:00 a.m. and 9:00 pm. Subject: [huffsantacruz] Stirring Up Life on the Sidewalks: 1 PM in front of Coffee Roasting Company Downtown S.C.